Welcome to the fold, Google Ads responsive text ads! We’re very excited to begin implementing these new Search Network ads for our clients for a variety of reasons, and not just for saving time! This is another move towards Google’s more extensive use of machine learning, which is used in this new ad type format. 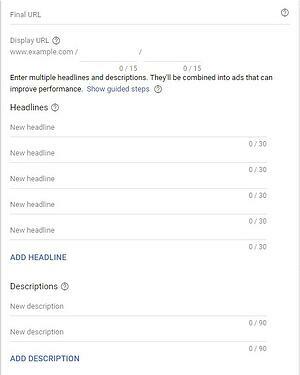 Recently, the new Google Ads expanded headlines with a third option and expanded description lines with additional characters and allowing a second description line. These same elements will be present in responsive text ads. With this new ad type, you’ll have the ability to use Google’s machine learning to help A/B test many ad variants in one single ad. So far, responsive text ads have one set of display URL path fields, but we expect that to upgrade as well. You’ll find the option under in the ad creation tab for “Responsive search ad Beta,” from there creating the ad is very similar to the process you’re already familiar with. Where it differs, is the options for additional fields. Here, you will write up to 15 headlines and up to four description lines for your ad. So far, we’re only given one option for display URL paths, but we’re guessing these will also be added to the mix once responsive ads are out of beta. After you have your headlines and description lines set, you’ll also have the option to “pin” ad copy to a specific place. Use this feature to keep pertinent sale or company information prominent on your ad. Once approved, the ads will rotate your ad copy based on effectiveness. To monitor performance of your new responsive ad, click “view asset details.” The Assets view will breakdown total impressions for each headline and description line while the Combinations view will the breakdown of impressions by complete ads that were made from various headline and description line combinations. We feel that Google is on track with streamlining A/B testing for ad copy with this new ad format. As always, we urge you to learn from our mistakes. Our team attempted to create responsive text ads for a client using the Google Ads Editor and were met with some errors. It turns out our client hadn’t been added to the beta program yet! We checked the web interface and saw the beta wasn’t listed. So, make sure you can see the responsive ad as an option before you try posting your changes! If your Google Ads account doesn't have responsive ads, try contacting your representative to begin using this new format.